You already read my mind ... those boots were the first thing I thought of after I ordered the jacket. The heel on is not all that high ... and feel fine ... I tried them on yesterday. I ordered these last weekend and expect them to be delivered today. 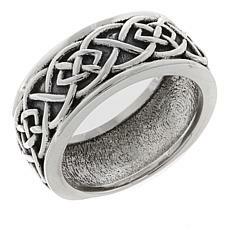 I also ordered a Nicky Butler ring that should be delivered some time next week. Beautifully made; they don’t have it in Petite, so the cuff needs to come off. These came and are a perfect fit; by Anthony HSN on clearance. When do you expect to hear about the new position? The new Coordinator started at the end of January. My guess is that there will be a few rounds to the interviews, so the first round is probably screening by HR. I haven't heard anything after I got confirmation that my application was received. I got the carved rose ring/necklace this week and they are both very DINKY. I will keep them, but really it would be perfect for a 'tween girl. @jackthebear I thought the dress was sharp.